Would you believe that you have helped send 8 million meals to the hungry in the Dominican Republic, Cambodia, and Kenya in just the past three months? Your gifts are making sure tens of thousands of hungry people are being fed with good, nutritious food. You are feeding the terrified woman in a Kenyan refugee camp, who is watching her children waste away from starvation. Because of you, her family can eat nourishing food so they are strong enough to keep searching for safety. You are feeding the malnourished child in a Dominican batey who is so weak with hunger, she can hardly get out of bed. Her dad has no work other than searching through the landfill next door to see if he can find plastic bottles or metal scraps to sell. Sometimes he spends the entire day at the trash dump and still comes home empty-handed – with no way to feed his daughter. 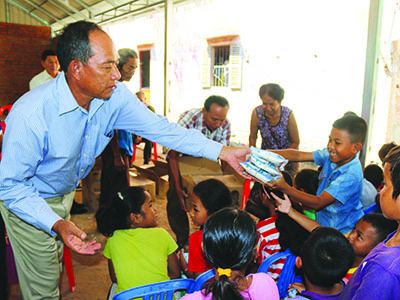 You are feeding the desperately poor in rural Cambodian communities. And, more than providing them with physical nourishment, you are sharing the Gospel with all of these people, everywhere you go! More food, and medical supplies, are available, but we need your help to get them where they need to go! Please consider making a donation to send this desperately needed food and medicine to those whose lives are hanging in the balance. Click here to donate now. Do you know what a “batey” (pronounced BAH-tay) is? Bateys are shanty-towns that were created for migrant sugarcane workers from Haiti. Today, thousands still live in these forgotten communities, and most of them have no legal documentation in the Dominican Republic or Haiti. They are truly people without a country. Bateys have no running water or electricity, and offer no education or medical care. But through your support, Kinship United cares for orphans who grew up in the bateys, and brings food and medical care to those who live there.